This painting was inspired by a visit to the Field of Dreams at the Barcroft Hall Estate in South Petherton, Somerset. The owners reclaimed some abused land and planted one of the largest collections of annual wild flowers from around the world. Several years running the fields were seeded and open to the public in the summer. This attracted thousands of people who came to walk in the meadow along the mown paths. A mixture of 57 species wild flower from around the world were broadcast sown to create a dense display of colour. 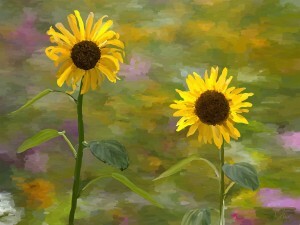 In 2012 a whole field of sunflowers were planted and the seeing the two fields next to each other suggested this combination as a subject to paint. An obvious choice here in the UK as spring arrives. I turned around one day and there they were in a vase. 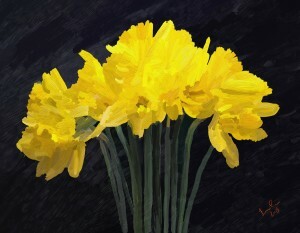 All I had to do was set up the lighting and background for this simple but satisfying painting. 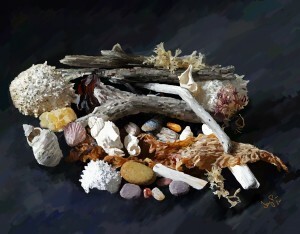 Painted in thick oil giving great texture set against a dark background. 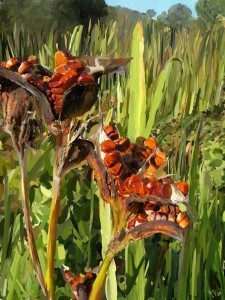 Painted in the grounds of a country house in 2009, this Iris was fruiting in the late summer on the edge of a pond. The satin finish to these seeds is most attractive. Their shape like a hockey puck, make me want to pick them and feel their shape and texture in my hands.